The second week began with team members preaching in churches throughout the city. Jesus saved, healed, and baptized many in the Holy Spirit. Prostitutes were won to Christ. 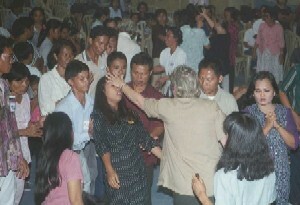 Signs of healing and power demonstrations confirmed the preaching of the word of God. Monday saw preparation for the Healing Meetings, Julie and Carol instructing the ushers, counselors, and prayer teams and sorting the details of the program for the week. For four evenings Julie preached in Lagao Stadium where over 300 received Christ, well over 200 were filled with the Holy Spirit with the evidence of speaking in tongues, scores were healed, and many were delivered end empowered. Healings; 5 or 6 deaf people received their hearing. One little girl had never heard a sound or spoken a word in her life. She was healed in the name of Jesus as Christina Cunnington, one of the team, prayed for her. Suddenly aware that she could hear, she dove into Christina's arms and spoke her first word in English: "Jesus!" It was an incredible moment. A man who was nearly blind had his sight restored. Crippled people stood and walked after prayer in the name of Jesus. Some were immediately strengthened, others increased in strength and mobility as they attended each night of the campaign and sat under the preaching. Stiff limbs and numbness were vanquished. Jesus healed headaches, heart and stomach problems, and much more during prayer. The Lord sent great conviction and power on these meetings. Each night people fell to the floor all across the auditorium; on the closing night people fell in waves as the Holy Spirit moved. As a team member laid their hands on an individual to pray, those surrounding the person would also fall under God's power, with no one touching them. It was a defining moment in the campaign. Several mothers holding babies in their arms went to the floor with child still safely in arms! 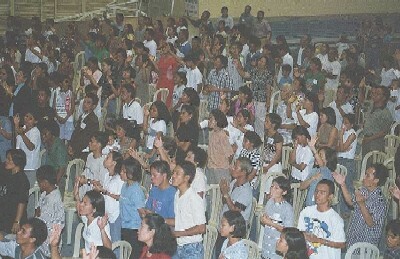 The team saw scenes similar to what Pentecostals of the early 20th century had described: "Many were the slain of the Lord". 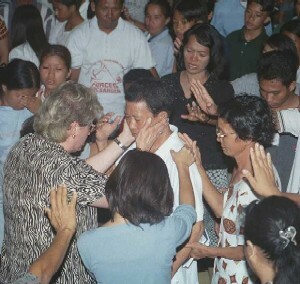 In addition to the miraculous healings and power demonstrations in the churches, pastors testified that they heard buzzing sounds in the auditorium during the Healing Meetings; others stated that that Julie's face was shining with a fluorescent light as she preached. Pastors spoke of changes in their churches, repentance, people being reconciled and called into full-time ministry. 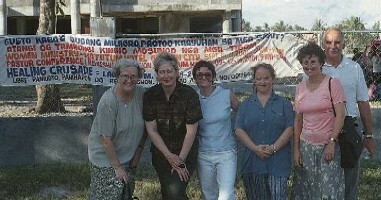 Prostitutes were won to the Lord as team members preached. It was a time of decision for Filipinos in the city and from other parts of Mindanao.